Dog Site: DOGS AND THEIR TOYS! There are many dogs that are found in pounds and are very much lost. Some of them are killed or thrown away. This happens when dogs start running away from you or either they have a craving to chase. This habit is found in almost all dogs but then again it depends on the kind of dog you have. If you have a lap dog then he would mostly sit and if you make it run all over it will for sure get annoyed. If you have a watch dog then it would require a lot of exercise, so you can’t make him sit 24/7. A dog should be dealt according to his quality. Each dog has its own quality so the quality has to be taken care according to the dog’s skill. If you have a racer car and you would ride it like a foxy it would be of no use in the same way your dog needs to be treated with all respect to his breed. All dogs were bred to do something and many of them were bred to chase a herd. These types of dogs would be your herding dogs e.g. Australian Shepherd, German shepherd, and Border collie and so on. You need to comprehend your dog’s nature and then learn all his interest. After you that it’s better to consult a trainer so that you know what would be the best way to treat the dog. As the owner need to focus this drive on something like a ball, Frisbee, tug or retrieval work. Now after you do this, notice all the aspects of your dog. We are not advising you to make your dog a toy but yes you shouldn’t ignore if your dog is running after a car or is chasing some stranger. You can always use those habits of his make good use out of them. This therapy can actually make you learn about their keenness towards things and his likes and dislikes. 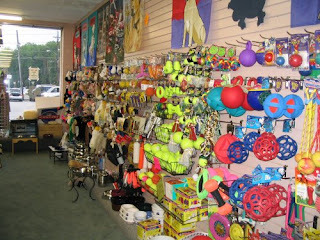 Knowing coming up to toys it is very essential for all the dog owners to start up with a toy. You take a simple ball ask your dog to start playing with it and used the code word “play”. Normally code word if injected in a dog’s brain for a couple of times the dog gets habitual to it and reacts accordingly. You will then notice either the dog is playing with the ball or is he chasing it. If he’s chasing it then you will derive your dog’s chasing features and if he’s playing with it you would discover his playful nature. There are retrieving balls, retrieving dumbbells, Frisbees, balls on ropes (my personal favorite), tugs and ropes. Now if your question is that which toy can be of great use for your dog then the answer is simple. Go to a toy shop and ask for some toys and let your pup choose the toy for himself. Then starts your derivation from the kind of toy to the way he plays it. For instance h picks a ball that means he prefers staying at home and if he chases it a lot then that means he loves to chase. This proves your pup is not a lap dog. An essential tool for training your dog to retrieve on both land and water, obedience training dumbbell o Medium Sized o Great training aid o Durable and hardwearing o Great for fetch game. This is ancient tool or toy to teach the guy and dogs learn a lot during this game. The retrieving of both land and water is very exciting for them and they get curious to fetch too. Most of the dog owners, in fact 90 percent are from the working class people. Know the working class people usually have a problem of leaving the dog alone at home. If the dog is left alone at home it is said to be very sulking condition for the dog itself or they get very rowdy. There are “KONGS” that are available in the market. What you can do is leave your dog with this Kong stuffed and filled so that they could all day long play with it. They would lick it, throw it chase it and do its entire trick. This is a trick to keep it busy. Stuff a few Kong’s with anything your dog loves (daily food, peanut butter, cream cheese, treats) and freezes or refrigerate overnight. Whenever you leave for office you would always be relived and contented that at least the dog’s chewing satisfaction would just get over. After that you can leave him with one Kong and the rest and hide the rest some where he likes to go the most in the house; for instance his favorite room or chair etc. So know after he finishes one he would go on for another mission to find the rest of the Kong’s. This would keep your sad puppy happy all day long and then he would sleep after doing this all day’s exercise. - Rated Top Product of the Year by numerous magazines and called the "world's best dog ball" by industry experts - this hyper-durable ball bounces, floats and has a peppermint scent that dogs find irresistible. It will become a playtime favorite and is also guaranteed. - Or bee-Tuff, Non-toxic and recyclable. Rinses clean. It is Imported and 5 1/4". Run a rope through the middle of one of these and you have an excellent fetching toy. - Canvas Training Dummies These dummies are great for training sporting dogs. Whether large or small, the realistic weight and feel will fulfill your training needs. Mostly dogs like a fetching toy so this toy is actually an asset for all the dog owners too. All these dummy toys we talk about you need to know they are dumpy and when can you give the toys to the dogs and when should you take it. After the playing time is over make sure you teach the dog how to place the toy back in its place. Many dog owners take the correct initiative to buy the correct toys and train them accordingly but they fail at the last step of keeping the toys back. This will make them even more disciplined. All dogs should play as they have a lot of energy which needs to be given out or they get very irrational at times. Find the correct nerve of your dog and keep him happy.